Position a rack in the center of the oven and preheat it to 350º F.
Place a large skillet over medium-high heat with 2 turns of the pan of EVOO, about 2 tablespoons. Add the onions and cook, stirring occasionally, until tender, 5-6 minutes. Remove from heat and cool slightly. While the onions are caramelizing, fill a large skillet with about an inch of salted water and bring it to a boil. Toss the asparagus into the boiling water and cook about a minute, until they’re bright green and tender. Drain into a colander and run cold water over them to stop them from cooking. Roughly chop them into bite-sized pieces and reserve. While the onions are cooling off, whisk the eggs, milk and cheese in a medium mixing bowl. Season lightly with salt and pepper and set aside. Arrange the bread in the bottom of a 13×9″ baking dish and top with the ham, asparagus and onions, giving everything a light toss to disperse the good stuff throughout the pan. Pour the egg mixture over everything. In Recipes-list.com we have selected the most viewed recipes from category - uncategorized . Enjoy the best recipes specially selected for you! 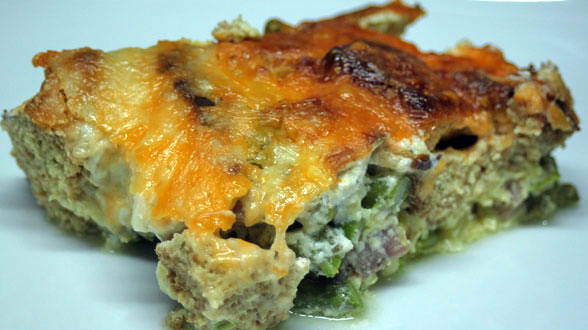 Ham and Cheese Strata is the right choice that will satisfy all your claims.